Open concept offices can promote an active exchange of ideas, but they can also lack privacy. Counter-intuitively, open offices can even discourage conversation when there isn’t a private meeting space both because employees may not want to broadcast their thoughts to the entire office or because they don’t want to disturb their neighbors. The problem compounds if your business grows faster than expected and people are squeezed next to each other. If you’re seeing people duck into the hallway to take calls, it’s time to think about adding a meeting room—fast. The ideal office layout achieves the best of both worlds by including both open and private space. Instead of planning renovations or renting, consider transforming under-utilized space in or around your office with a modular meeting room. Why consider modular or pre-fab meeting rooms? There’s no getting around it: post move-in office renovations mean months of disruption. You and your employees will be trapped with the noise of drills and a fine coating of drywall dust until the contractors are done. 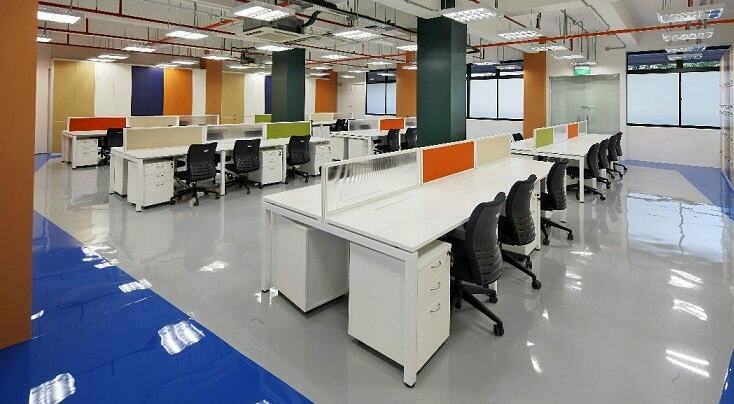 For businesses that rent office space, renovations aren’t even on the table if the landlord isn’t on board. Renters that need to augment their office space may be stuck in their existing arrangements until they run down the clock on their lease, which may be years. Installing a modular or pre-fab meeting room can take less than an hour—keeping your employees happy—and often requires no modifications to your existing office—keeping your landlord happy. Because shipping container-based meeting rooms are upcycled from a pre-existing structure, they’re an especially fast and cost-effective solution. 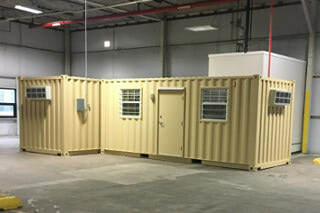 Within a few months, a containerized meeting room can be shipping and placed in your office. 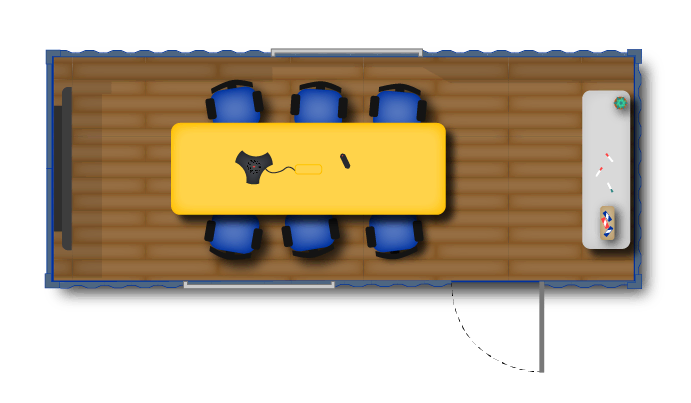 Layout for a meeting room inside a 20-foot shipping container. When estimating the size of your future meeting room, think about your goals. Are you creating a quiet space for four to six employees to pop into, or are you planning to host meetings for 10+ people? On top of the table and chairs, a meeting room may also include a teleconferencing system, white boards, and a station for amenities like coffee and snacks. A 20-foot container can accommodate smaller meetings for employees, but if you’re hosting 10+ guests you should think about something more spacious. The great thing about going modular is that rooms are easy to scale up. 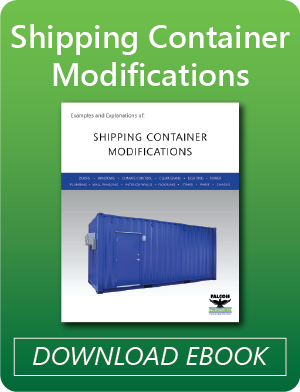 If you need a large conference room, or even an entire auxiliary office, you can consider merging two shipping containers. With the right structural reinforcements, two shipping containers with cut-outs can be conjoined to create a larger open space. Container-based meeting rooms can go either inside or outside your building. Their final location should inform your design choices. Containers are a good fit for offices and with high ceilings and warehouses because these spaces provide enough room for a forklift to roll in and drop off the meeting room. Concrete floors are also ideal because you won’t have to worry about the weight of the container damaging the flooring. While you can’t beat containerized meeting rooms when it comes to speed, they’re heavy, and we don’t recommend them for upper floors. If you need private space a few stories up, a modular room assembled on-site with lighter-weight panels may be the best solution. Meeting rooms with glass walls are popular because they create a sense of openness even in relatively small spaces. Plus, people passing by don’t have to pop their heads in to see if the room is occupied. Sliding glass doors and windows can be installed in container conference rooms, but they call for structural reinforcement, which may raise the price tag. Maybe it’s just too crowded inside your office building to designate any space for a meeting room. Office trailers are an option, but those boring beige vinyl exteriors and trailers can be an eye sore. With custom colors and murals you can make a containerized-meeting room a place you actually want to show visitors. 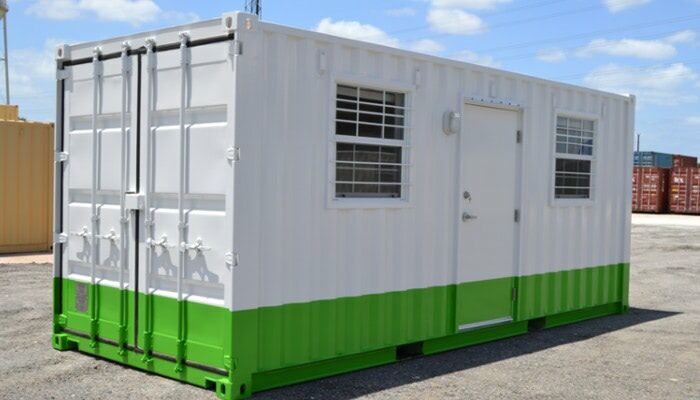 Containerized meeting rooms can be placed directly in a parking lot, a courtyard, or anywhere with a flat, level and dry surface—no site prep required. Blog post: What can a shipping container structure interior look like? As always, we’re happy to be a resource as you grow your business. Thinking about a containerized meeting room? We’ll answer your questions. Contact us at 877-704-0177 or sales@falconstructures.com. Photocredit for first image: Office scene, Root Impact, CC BY 2.0.